One of our clients recently asked me how to share another person or organization’s photo album on her organization’s Facebook wall. With a personal profile, it’s easy: you see an album you like and you can either click “Share This Album” or “Post Album to Profile”. With a Fan Page, though, that’s not an option. But! You can post a link to the album on your organization’s wall. You can also tag the person who posted the album in your post, which means the post will show up on your organization’s wall and on the wall of the person or organization who originally posted the album. I’m going to post an album from the Humane Society’s Walk for Animals to the Facebook wall of my organization, the Superhero Animal Rescue. 1. Copy the link to the album. On your organization’s wall, click Attach a link below the box where you can post to the wall. 2. Paste the link in the Link field and click Attach. 3. Type the @ symbol and start typing the name of the person or organization you want to tag. 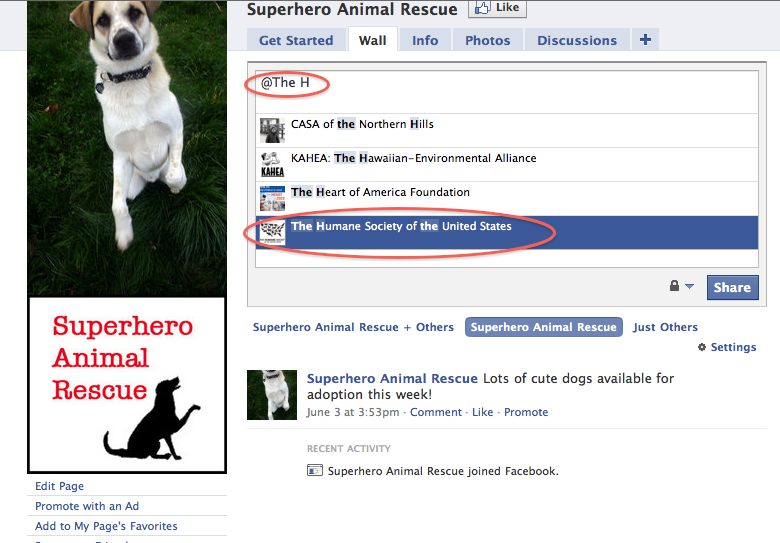 I want to share an album from The Humane Society of the United States, so I typed @The H, and then Facebook suggested a list of possible people/orgs I could tag and I selected The Humane Society. Note: You’ll only be able to tag a person if you’re friends with him/her and you’ll only be able to tag an organization if you’re a fan of its Facebook page. …and on the Humane Society’s Wall.